S3’s simple web-services interface enables applications to store and retrieve any amount of data from anywhere on the Internet. S3 is a highly scalable, reliable, fast, and inexpensive data storage infrastructure, and thousands of enterprises rely on it for their production storage needs, from “cold” inexpensive storage to serving rich multimedia in real time to customers worldwide. 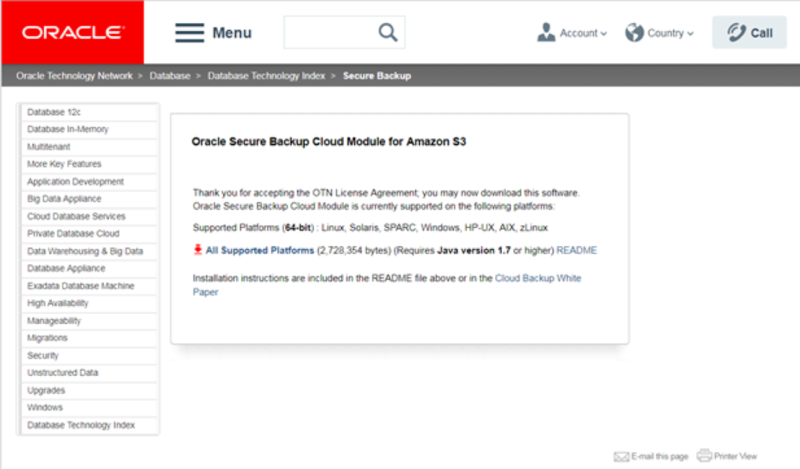 The Oracle Secure Backup (OSB) cloud module enables an Oracle Database to send its backup to Amazon S3. It is compatible with Oracle Database versions 9i Release 2 and above, requires a network connection to the internet, and provides the means of payment to AWS. The OSB cloud module can also be used while the database is running within the Amazon Elastic Compute Cloud (EC2). This way it benefits from the higher internal network bandwidth without any transfer costs in to or out of S3. The OSB cloud module is implemented by using the Oracle Recovery Manager (RMAN) serial backup tape (SBT) interface. The SBT interface allows external backup libraries to be seamlessly integrated with RMAN. Consequently, database administrators can continue to use their existing backup tools, such as Enterprise Manager, RMAN and other scripts, and so on, to perform cloud backups. The OSB cloud module is available for Linux® 64 & SPARC® 64. The versions for Microsoft® Windows 32-bit and Linux 32-bit are deprecated. The following sections walk you through installing the OSB cloud module and configuring a sample cloud backup. Register for an Oracle.com or Oracle Technology Network (OTN) account. You must have one of these accounts to install the OSB cloud module. New accounts can be created by visiting the OTN website. Download the OSB cloud module install tool from the OTN website and run the following code to install the module. Oracle Secure Backup Web Service wallet created in directory /u01/app/PROD/db/tech_st/11.1.0/dbs/osbws_wallet. Oracle Secure Backup Web Service initialization file /u01/app/PROD/db/tech_st/11.1.0/dbs/osbwsPROD.ora created. Downloading Oracle Secure Backup Web Service Software Library from file osbws_linux64.zip. Notice that the first backup was a local one run earlier and shows a local backup piece (file). The second backup shows that the media was s3.amazonaws.com. The oracle-data-vickey07-1 is the bucket, or logical container, automatically created within Amazon S3. The Oracle OSB cloud module allows customers to use Amazon S3 as their offsite backup storage destination. Compared to traditional tape-based offsite storage, cloud backups are more accessible, faster to restore under most circumstances, and more reliable. They also eliminate the overhead associated with maintaining offsite backup operations. Cloud backups ensure optimal protection for databases running within the compute cloud. Learn more about our Rackspace Application Services.